Iyad Burnat has led nonviolent resistance in the village of Bil'in for over a decade. Iyad Burnat has led nonviolent resistance in the village of Bil’in for over a decade. As coordinator of the Popular Committee of Bil’in in Palestine, one of Iyad’s goals is to spread the word about the incredible story of the nonviolent resistance in Bil’in. Using creativity and resourcefulness, he has led many direct actions that have gained significant publicity across the globe. 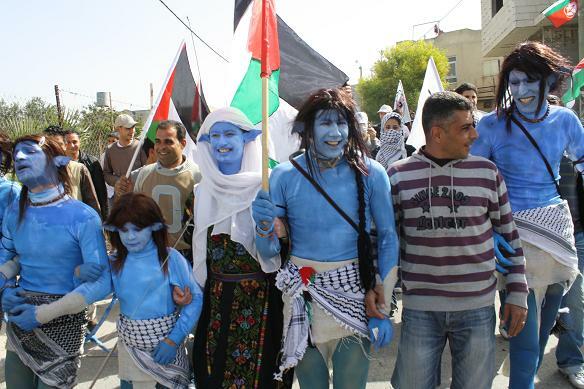 The village of Bil’in reenacted the science fiction film Avatar during one of its Friday demonstrations. Coming soon: a video interview with Iyad, in which he talks about his role as leader, how nonviolent action is effective, what gives him hope, the role creativity plays in his movement, and more….